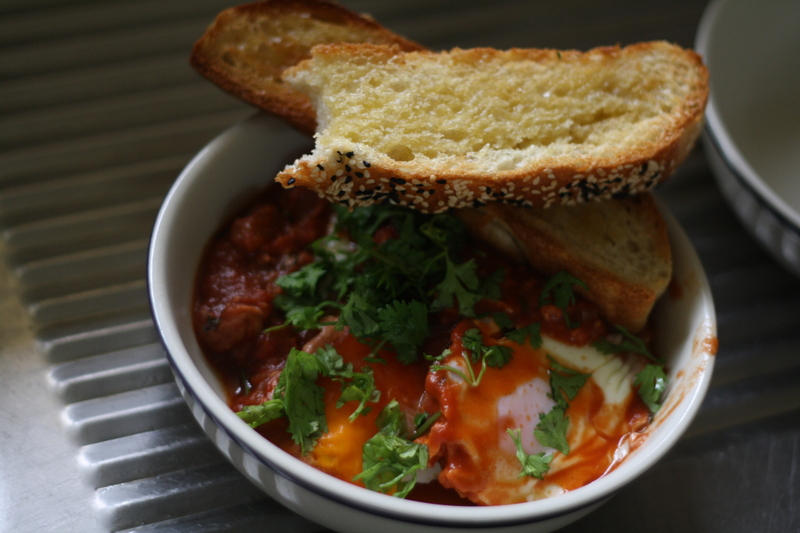 Another recipe from Trotski & Ash I’ve been wanting to try for a while are these baked eggs, apparently an excellent hangover salve. This morning I had no such hangover, but the miserable, rainy weather provided the perfect excuse for a warm breakfast. After a damp walk downtown to get the weekend papers and some fresh bread from the bakery, it was lovely to get to work in the kitchen with a cup of tea, the pre-heating oven and spices in the air warming the apartment in no time. My chef friend had snuck me a couple of chorizo sausages from his kitchen (cue many inappropriate jokes) and I thought that would make a nice addition, so I added some to the sauce. This dish works best if you have a frypan/skillet or pot that can go from the stovetop to the oven; or would be super cute in individual ramekins. Fry the onion in a little oil until translucent, with some chopped chorizo if that’s your fancy (in which case you shouldn’t need much extra oil at all). Add garlic and cook a further few minutes before adding the paprika and stirring it through. Add tomatoes and passata, season to taste and let the sauce simmer down at a low heat for 15 minutes or so. I put in some chopped coriander and parsley at this stage too. Make little wells in the sauce and crack an egg into each. This I found a little tricky, perhaps my sauce was too runny. It’s breakfast though, not brain surgery, so mess comes with the territory. You want a bit of sauce under the eggs anyway. Cook on the stovetop a few minutes, until you see the whites start to cook at the bottom. Transfer the pan to the over and bake until the eggs are cooked as you like them. Mine were in the oven about 12-15 minutes and they were a little too firm… I think these would be glorious with runny yolks to dip your toast into and mix with the sauce. Serve with buttery toast and some roughly chopped fresh herbs on top. Ooh yours look great too! I will be trying those. Baked egg exchange! this looks great! a nice way to start a rainy morning.